The Gray Report: Is there radiation in Japanese sake? I think this is short-sighted, but I'm not sure what the answer is. Maybe put a map of Japan on the label, with the location of the brewery in red, the universal sign for radiation in black and yellow, and a little arrow pointing eastward to Oregon from Fukushima? Unfortunately one of my favorite sake prefectures, Yamagata, is immediately north of Fukushima, though take a look at the map: rice in Yamagata grows along the sea of Japan side to the west, because the area just north of Fukushima is mountainous. Miyagi, Tochigi and Ibaraki prefectures surround Fukushima to the north and south, and they're both east and right in the path. Iwate prefecture is about 300 km north of Fukushima, and it is to the east. Lots of rice comes from there. It's a big political issue: Tokyo consumers no longer trust their government (if they ever did), but they don't want to stop eating rice either. Kuji told me that every batch of the rice he buys from the co-op is tested by the government for radiation: every one. And every tank of sake he makes is sampled by the government and tested for radiation, because Japanese consumers worry about the water being irradiated. Because he lives there, and he's an academic when he's not brewing, he also samples every tank of sake for radiation. He says they have all come up negative. I believe him. Kuji also says that the government will not publicize this program because it fears that would put thoughts of radiation in consumers' heads. In fact, immediately after the nuclear disaster, people stopped drinking sake from the entire Tohoku part of northern Honshu (the main island) for a time. Kuji worked on a Youtube video that explained to Japanese people that the sake industry, which has been shrinking for 40 years, would be devastated and might disappear like so many other traditional Japanese arts. He showed his own radiation testing regimen. The video went viral. Sake sales in Japan last year actually rose for the first time in 40 years, and Nanbu Bijin sells out, perhaps because everyone in Japan knows Kuji has his own geiger counter. I know this won't make some brewers happy, but I would be a little squeamish about sakes from Fukushima, Miyagi and Ibaraki. Fortunately, those were never my favorite sake regions anyway, and you would really have to look hard to find sake from there in the US. I believe in the government's testing program, because for once the usually compliant Japanese media has been making a big deal about it, sometimes testing rice and other agricultural products on their own. Sake from the rest of Japan, I feel very confident in. Is there a chance of radiation? The chance might be higher in Oregon. Seriously -- just look at the wind path. But you can scare yourself that way if you want. If you want to say the chance is greater than zero, there's also a chance that a cursed video will make you die of a heart attack exactly seven days after watching it, and a dead girl will crawl out of your TV screen to make that happen. I love "Ring," one of the best horror movies every made. Now that's scary. Japanese sake, that's not. Interesting topic, which I feel needs fair debate (which I unfortunately don’t feel it’s been getting). Tohoku region arguably makes the best sake in Japan; throw neighboring Kanto into the mix and your argument gets that much stronger! Many of these brewers are still reeling from the effects of the devastation caused by both the Tsunami and Nuclear disaster; but at the same time, lack of knowledge and misinformation is not helping their cause. 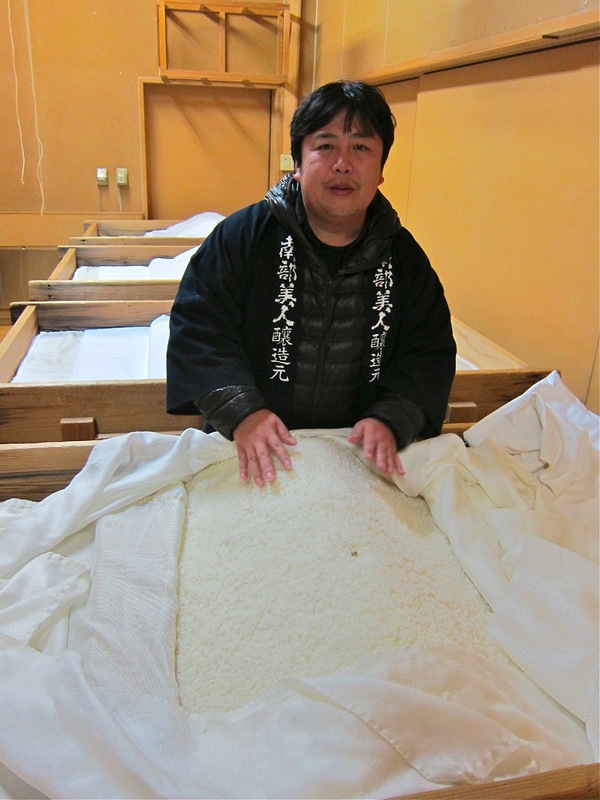 Sudo Honke, which has been making sake since 1139 (first released 1141) almost lost everything due to the tsunami. I had a lunch with Takeshi Tsushima (GM of Okunomatsu, Fukushima Prefecture) here in Toronto last October. He provided me with government and brewery documents on radiation level readouts where becquerels/per/kg levels were below government safe levels. Now in being realistic, the amount of sake one would need to drink to feel any physical effects (radiation poisoning) of the fallout would far surpass the physical ability to consume that much. It would be like trying to have opiate levels hit the radar by eating Poppyseed bagels – let’s put reality where it truly is, off the micro Geiger meter counts and into that of physical possibilities based on consumption levels. With sake being 80/20 rice to water in terms of ingredients, the rate at which the rice could pass radiation contaminants after going through the entire sake making process is trace at best. With much of the water coming from underground and high mountain sources, the ingredient contamination factors that could affect lethal levels were a bit more at a panic and immediate level than one need for concern. I still drink sake from both Tohoku and Kanto regions, but honestly, I have maybe 1 bottle a month from these regions. Living in smog filled cities will be more detrimental to my health than quaffing some brew from these regions. I think people need to back off the panic button on an industry where numbers are struggling and in a decline anyways, as if we keep this up; we made have far less sake to drink period, in the very near future….now that is a realistic fear! Gray - Please don't scare people off Oregon pinot! Unless of course you make it cheaper. Your observation on wind direction is correct and relevant, except for two things: There was a short period immediately after the tsunami and the meltdowns when the wind shifted to the northeast, thus the evacuation zones. And as for radiation reaching Oregon - here my two worlds collide, as a wine writer blamed on the Internet for orchestrating the (fictional) federal coverup of the radiation plume reaching the US. The distance is key - only trace elements made it to the US, and only lighter, shorter lived isotopes. The more serious isotopes are heavier, and would have "fallen out", so to speak, long before reaching here. So don't worry about Oregon pinot, except for excessive alcohol levels.